The Norton Sound-Port Clarence Area includes all waters of Alaska between Cape Prince of Wales and Point Romanof, including the waters surrounding St. Lawrence Island. The census includes 17 communities with about 9,500 residents. A third of the regional population lives in Nome (pop. 3,500). The remaining communities average about 500 residents. Most of the communities are located on the coast. Norton Sound and Port Clarence residents have relied on fish for cultural and nutritional sustenance for thousands of years. Fishing occurs in both marine and fresh waters. Comprehensive harvest surveys estimate that the five species of Pacific salmon comprise about two thirds of the total fish harvest in the area, with Dolly Varden, whitefishes, herring, king crab, saffron cod, northern pike, and other species making up the other third. For the mainland communities, diet surveys indicate that subsistence-caught fish contribute more than half of the meat, fish, and poultry consumed by area residents (Ballew et al. 2004, Magdanz et al. 1995 TP, Conger & Magdanz 1989 TP). A Kawerak comprehensive subsistence survey estimated that 5,130 residents of 12 area communities (not including Nome) harvested 471,068 pounds of salmon and 285,056 pounds of other fish for subsistence uses in 2006. (Ahmasuk et al. 2007) Two-thirds of the respondents reported consuming wild foods at least three days a week, 20% consumed wild foods 6 or 7 days a week. Several different surveys have estimated salmon harvests in Norton Sound and Port Clarence, producing similar results. Conger and Magdanz conducted comprehensive surveys in Golovin and Brevig Mission in 1989, and estimated the harvest of all types of wild foods to be 605 edible pounds per person per year in Golovin and 579 edible pounds per person per year in Brevig Mission. These were similar to estimates of total wild food harvests in other small northwest Alaska communities. 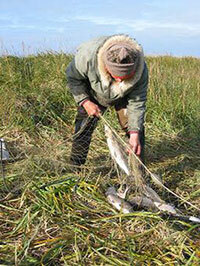 Salmon contributed 161 pounds per person in Golovin and 118 pounds per person in Brevig Mission.